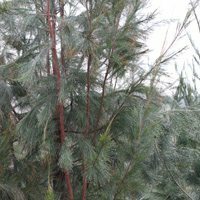 Use them to attract birds, or as an easy care screening tree, Allocasuarina are a varied group of small to medium sized trees with around 60 species being found. With varieties found from mid North Queensland along the east coast to Victoria and Tasmania and then west to Perth and much of the southern half of Western Australia this is a diverse group of plants. The species are commonly called She-Oak, and are varied in growth habit and form.With some species being tolerant of saline soils they are also a useful plant for revegetation and land reclamation purposes. These are a useful group of Australian native plants, with many garden worthy species. Some make good feature trees, others are excellent as screening trees and windbreaks. They are grown in gardens and parks for the attractive foliage and ability to cope with harsh climates, these adaptable plants are now finding a wide range of uses in landscaping projects. Although they have not been widely used in landscaping until recent years, Allocasuarina species are now finding a place modern landscaping applications. Used in street plantings as well as commercial building areas especially industrial areas. 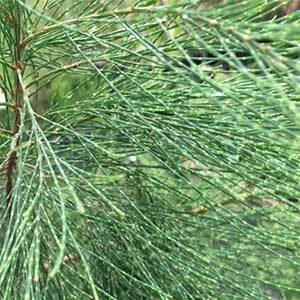 Allocasuarina or ‘She Oaks’ have foliage that resembles pine needles, and as with pine like needles, nothing much grows beneath Allocasuarina or ‘She-oaks’. A number of species are now being used as landscaping plants with great success are listed below. A. verticillata has a more spreading habit and makes a good street tree, commonly called the ‘Drooping She-Oak’. A. inophloia is referred to as the ‘Woolly oak’ due to the wooly appearance of the bark. A. crassa comes from Tasmania and has been found in prostrate forms. One of our favourites is Allocasuarina grampiana great blue green foliage this one is a smaller growing species with great potential. A. distyla is a smaller growing species to around 3 metres in height, commonly called the shrubby sheoak. A. tortulosa is the Forest She-Oak reaching around 10 metres in height. A.luehmannii is the Bull he-Oak or simply Bull Oak, reputed to have one of the hardest timbers of all trees. This varied group of plants are found in many areas of Australia. A. verticellata is found in NSW and the ACT. A. inophloia is found in Queensland and Northern NSW.